According to the Deputy Minister of the Treasury: “In accordance to the data of the Bolivian Economy Report 2017, a proportion of 43 percent is destined to Transport infrastructure, 18% is for multisector spending, 7% to basic sanitation and 4% to agricultural sector”. 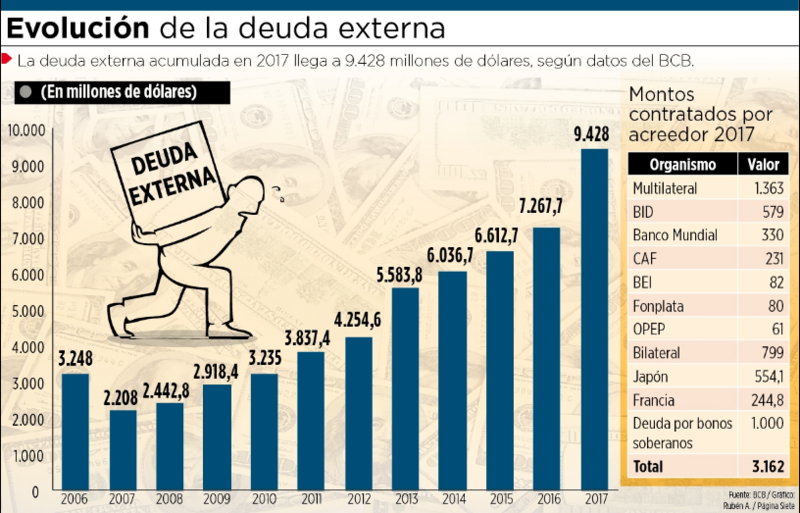 The new indebtedness for this year “would be similar to the one executed in 2017 that reached $2,397 million dollars, of which 41.7% came from the issuance of sovereign bonds, 45% from multilateral sources and 12% from bilateral loans.” The same official clarified: “the acquired foreign debt is sustainable, although any obligation of this nature with their respective interests must be paid, besides that 23 percent is attributed to the so-called “Gross Domestic Product” (GDP) the same as when concluding 2017 went up to 25 percent.” As of May, the amount disbursed reached $9,575 million dollars, but if the amount contracted were disbursed, the stock of external debt for the present year would reach $11,000 million dollars” (ED 31-7-18). It is undeniable that borrowing when there is sufficient production and availability of money is good as long as it is invested in something profitable, in what ensures the honoring of the loans contracted; but when there is no investment or production and exports have dropped considerably, any loan that is contracted increases the external debt that, later, at maturity, is difficult to honor. The government, in accordance with the studies of its economic authorities and surely with the advice of the International Monetary Fund, would have foreseen all the contingencies that derive from an excessive indebtedness. In any case, what the community will require at all times is that there be clear information about the state of the debt and about the investments made; otherwise, the problem is crucial because the situation could arise in which there is no assurance of with what money will it be paid, in addition, includes generally high interest, as is the case of commercial banks. Prudence and clarity are required in all the economic-financial aspects of the country and this for the benefit of the government itself, which based on the detailed reports, will know what to expect. This entry was posted in Bolivia, Business, Economics, Politics, Social Unrest and tagged bad politics, corruption in public office, demagogue, government failures, macroeconomics. Bookmark the permalink.